If you are among the many who have become obsessed with cleansing oils, then you owe it to yourself to add aroma M Beauty Camellia Cleansing Oil to the top of your list. This luxurious handcrafted gem is the creation of world renown perfumer Maria McElroy, and therefore the delectable scent, alone, is enough to win you over. However, this ultra luxurious cleansing oil does an enviable job in its ability to deeply penetrate the skin to draw out more than just surface dirt and makeup, and it's suitable for all skin types. The first way simply involves massaging the oil into the face, neck and décolleté until you have lifted makeup and dirt, and then rinsing with warm water. There is no need to double cleanse, but if you prefer double cleansing then you can follow this step with your favorite cleanser. It should be noted that aroma M Beauty Camellia Cleansing Oil will break down and remove every trace of eye makeup– including mascara, but I prefer using an eye makeup remover beforehand so that I don't have makeup smeared all over my face during this cleansing treatment. The second way is to use aroma M Beauty Camellia Cleansing Oil as a weekly deep cleansing treatment. Simply warm a generous amount of the oil between your hands, and then massage it into your face, neck and décolleté for about five minutes. This method is a highly effective lipophilic remedy that deeply penetrates the skin and removes impurities. The oil is the perfect medium for a gentle facial massage as well as lymphatic stimulation, and this combination is essential to effective deep cleansing. Furthermore, its antioxidant rich formula moisturizes the skin, and it even regulates sebum production in oilier skin types. In ancient times both woman and men would spend hours on their bathing rituals to cleanse and nourish their skin. Only in recent times has oil been put aside in favor of chemical concoctions. Camellia Oil is better than the usual cleansing oils because it is very rich in antioxidants while also being very nourishing to the skin due to high fatty-acid content. In addition to Camellia Oil we have added Rice Bran Oil, high in skin-softening Vitamin E. These are very fitting oils to use as they both have a long history in Asian culture and the Geisha have mastered incorporating them into their routine over time. Although this is a cleansing oil, these oils will wash off easily. Besides removing makeup, Camellia Cleansing Oil also nourishes skin and imparts a soft, dewy finish. Aroma M Beauty’s Camellia Cleansing Oil is a rich emollient oil that penetrates deeply to draw out impurities and is suitable for all skin types. 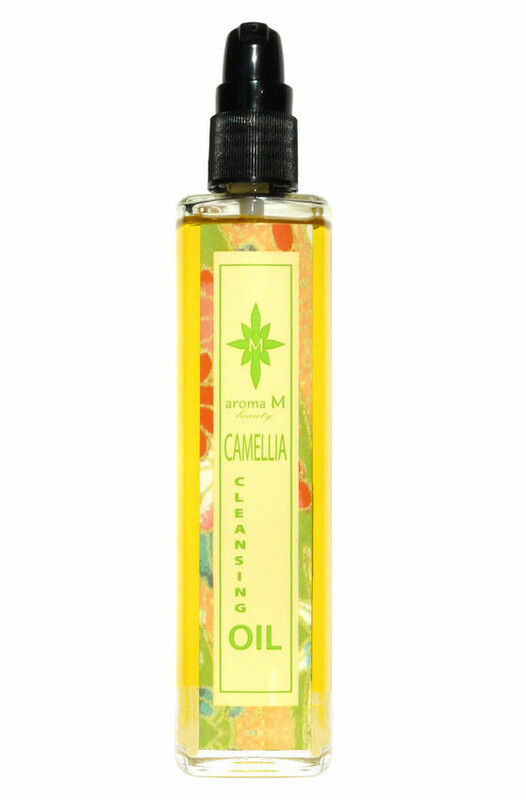 Camellia Cleansing Oil is packed with beneficial fatty acids: Organic Camellia Seed Oil, Organic Rice Bran Oil, Organic Golden Jojoba Oil, Organic Vitamin E, Organic Essential Oils of Neroli, Yuzu, Rosemary and Frankincense. The organic oil-based formula sinks into the pores and dissolves readily into the skin’s natural oils, drawing impurities and bacteria to the surface where they can be wiped away. Glossy and easily rinsable, Camellia Cleansing Oil is ideal for gentle facial massage and lymphatic stimulation, both of which are essential keys to effective cleansing. Ingredients: Organic Camellia Seed Oil, Organic Rice Bran Oil, Organic Golden Jojoba Oil, Organic Vitamin E, Organic Essential Oils of Neroli, Yuzu, Rosemary and Frankincense. Camellia Oil: "Camellia oil has been a Japanese beauty secret for centuries, and considered to be so beneficial and valuable that has become a symbol of wealth, virtue and happiness. It is made from cold pressed Japanese camellia (Tsubaki) buds, which is a member of the tea family. It is very lightweight and absorbs well. Camellia oil is lighter than oils such as shea butter and jojoba, and is hypoallergenic and will not clog skin pores. It is a superb daily moisturizer and emollient, protecting skin from chafing and drying out, and replenishes vital nutrients, as it offers a variety of healing, nourishing and stimulating properties to purify and protect the skin. It restores skin's pH balance and shields skin from penetration of environmental pollutants. It acts as a natural sun block by forming a barrier against harmful UV rays." Rice Bran Oil: "Rice bran oil is obtained from the outer layer of the rice kernel (the bran). This light golden oil gives a soap rich, creamy texture and has many benefits for the skin. It is excellent for sensitive skin due to its moisturizing and exfoliate properties. Rich in Vitamin E and fatty acids, rice bran oil is able to deeply penetrate into the skin’s layers, nourishing from within, making your skin very soft and velvety. It improves skin’s elasticity, making it appear more youthful and plump and hydrates the skin and helps it to retain moisture, making the skin smooth. Rice bran oil boosts skin’s natural regeneration process and can help to renew and improve the skin’s surface. It nourishes skin cells with vitamins and antioxidants, slowing down and preventing aging process. It improves overall complexion and helps to even out the skin tone and reduce the appearance of wrinkles and fine lines, and doesn’t clog pores. It naturally helps to protect the skin from sun damage, and is easily absorbed into the skin, so it’s not likely to increase oiliness. This oil helps to brighten and even slightly whiten the skin, and has anti-inflammatory properties that can help sooth and calm down irritated skin. Rice bran oil protect the skin from external aggressions such as wind, cold and polluted city environments, and can protect the skin from harmful sun damage, working as a natural sunblock." Golden Jojoba Oil: "Jojoba oil naturally heals skin damage with its beneficial stimulating and purifying properties. It is wonderfully effective in sustaining the skin’s natural moisture as needed to prevent dryness. The extract of the seeds mimics the natural oil produced by sebaceous glands in the skin and is absorbs quickly to impart a velvety finish." Frankincense: "Frankincense is a powerfully beneficial and fragrant skin rejuvenator. It is antiseptic and anti-inflammatory and can balance oily or dry skin. It improves skin's tone and texture and speeds healing and is helpful with acne, and blemishes. It can reduce the appearance of scars and age spots. Because it encourages new skin cell growth it is excellent for fighting the signs of aging." Neroli: "Neroli oil is a fragrant skin cell regenerator and also helps the skin retain moisture. It has a smoothing effect on the skin and helps heal scar tissue and fights broken capillaries. It is beneficial for dry and aging skin because it aids in skin cell growth and also improves skin's elasticity." Yuzu: "The Yuzu has quite a history in Japan and has been used for centuries by Japanese farmers for 3 main purposes: culinary, bathing, and medicinal. Bathing with Yuzu on the winter solstice (Toji) is a Japanese custom that goes back as far as the 18th century. It’s believed that bathing with this aromatic fruit wards off illness such as colds and flu, increases circulation, and promotes smoother skin. Today Yuzu oil appears as an active skin care ingredient that naturally brightens, energizes, and tones the skin. 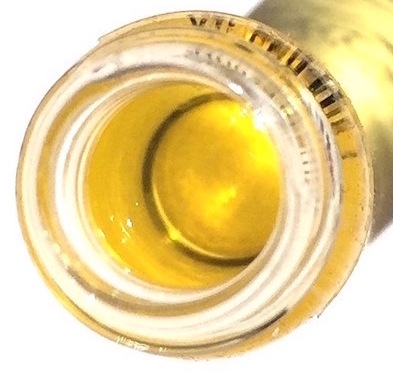 You will find that with this oil your skin looks brighter, fresher, and more alive, and when applying it to your face the aroma fills you with the most beautiful and uplifting scent." $40.00 for 100ml. and $15.00 for a sample from aroma M (Unaffiliated Links). I enjoyed this cleansing oil review...funny how we are going BACK to what works for geisha and elite classes for the skin! I am not familiar with this brand, but I've heard such great things about camellia oil and now your flowing review! Something I must try this year! This is definitely a brand that you should look into, Allison! Maria is a small atelier perfumer who makes incredible products. In addition to her handmade perfumes, she also makes oils for the face, hair, body and this cleansing oil! I love cleansing oil! I can't believe I was afraid to try it for years. Cleansing oils are absolutely amazing! I think that many people approached them with fear, but they have now become so mainstream that people who were once freaked out by the notion of slathering their faces in oil are now entering the fold! If anyone knows oils for cleansing, it's you. I trust your judgement on this kind of product. Too bad my nose doesn't enjoy the fragrance. You are so kind to say that, Marcia! I really appreciate that! As gorgeous as this scent is, I think that your scent sensitivities would probably prevent you from enjoying it. It is neither cloying, nor overpowering in the least, but the Camellia scent is definitely there. Ooh, this sounds so great! I like the idea of suing as a deep cleansing treatment. It is absolutely divine, Bailey! Yes, using it as a deep cleansing treatment is incredible! This oil sounds amazing. Usually, cleansing oils and I don't get along but I find myself really wanting to try this one! It really is a lovely cleansing oil! I definitely recommend this one, and everything that I have tried from Aroma M has been absolutely amazing!